SONIC’s Sweet Pretzel Twist is a Snack Masterpiece | Sonic Corp.
OKLAHOMA CITY--(BUSINESS WIRE)--Oct. 29, 2018-- Why choose between savory and sweet when you can have both? 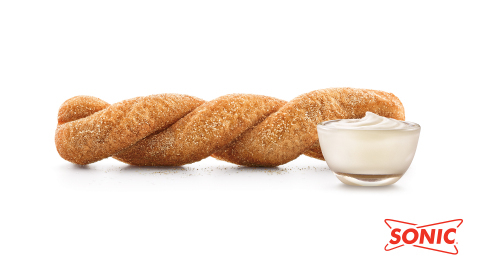 As one of the only fast-food restaurants offering a soft pretzel, SONIC® Drive-In (NASDAQ: SONC) is expanding its snack lineup with the Sweet Pretzel Twist, a cinnamon-sugar take on the popular salted Soft Pretzel Twist. Instead of savory salt, the sweet version of the Soft Pretzel Twist is dusted with a delightful sprinkling of cinnamon-sugar on top of soft, buttered and golden-brown dough. The Sweet Pretzel Twist is served with a creamy side of sweet cream cheese frosting to satisfy those cravings that hit at all times of the day. Guests can stop by their nearest SONIC Drive-In to try the Sweet Pretzel Twist for just $1.99 all day long until supplies last*.